BROCKWAY, Pa. (D9Sports) – A pair of rematches are at the forefront of the District 9 Class 1A semifinals with second-seeded Clarion-Limestone taking on sixth-seeded Coudersport at 7 p.m. Friday, Nov. 9, at Brockway’s Varischetti Field and top-seeded Smethport battling fifth-seeded Curwensville at 7 p.m. Friday, Nov. 9, at Bradford’s Parkway Field. C-L (9-2) notched a 34-22 win at home over Coudersport (6-4) back in September, while Smethport (10-0) took a 20-7 road victory from Curwensville (7-4) also in September. C-L (9-2) vs. Coudersport (6-4), Varischetti Field, Brockway, 7 p.m. 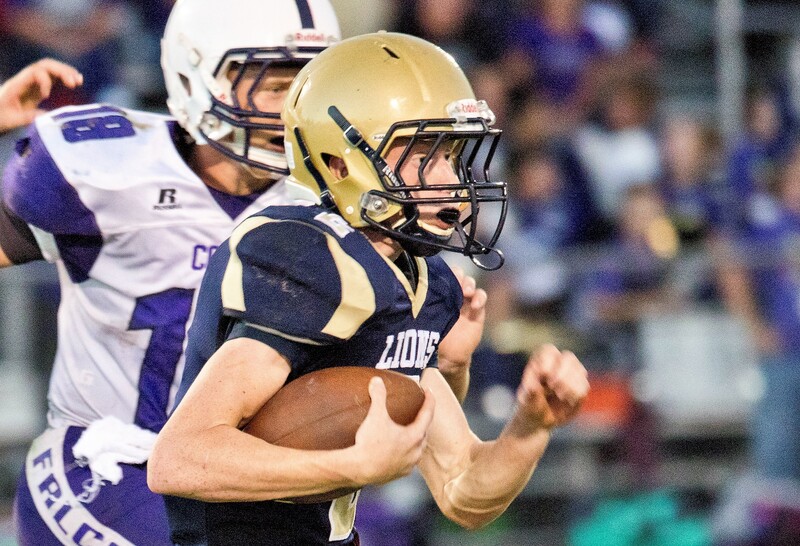 In the Lions win during the regular season, C-L held a 34-6 lead before Coudersport scored twice in the fourth quarter to set the final. Last week, both teams put up big numbers in first-round wins. The Lions dumped Otto-Eldred 48-18 while the Falcons avenged a 41-27 loss at Redbank Valley with a surprisingly lopsided 52-7 rout on the same field. While junior Austin Newcomb is closing in on a district record for rushing yards for a season with 2,442 yards, See Story Here, he’s also looking to build on what’s already a district record for points in a season with 284 points — 41 TDs and 19 2-point conversions. While Newcomb has put up huge numbers, he’s not the only one who’s helped the Lions pile up 4,033 rushing yards as senior Ayden Wiles (154-1,089, 17 TDs) went over 1,000 for the season. Newcomb and Wiles have combined for 60 of the team’s 70 TDs. Quarterback Colby Himes (51-for-110, 1,030 yards, 10 TDs, 6 Ints.) just went over 1,000 yards for the season. His top receiver, not surprisingly, is Newcomb (25-572, 5 TDs). Defensively, Mitch Knepp (8.1), Newcomb (7.1) and Kyle Bottaro (7.0) lead the Lions in tackles per game. The Falcons feature a run-oriented attack led by senior running back Stephen Kelly (157-1,296, 21 TDs) and quarterback Hayden Keck, who’s rushed for 461 yards and 11 TDs. He’s thrown for 517 yards with seven TDs and three interceptions. John Minor (7-253, 3 TDs) is the leading receiver. Defensively, Eli Ayers leads the unit in tackles per game (6.8). Brandt Kightlinger has seven sacks while Minor leads the team with four interceptions. This is the fifth playoff meeting between the teams. The Falcons have won three of four so far, including last year’s 44-40 win at C-L in the opening round. The Lions beat the Falcons 21-14 in the 2004 semifinals. Coudersport won semifinal matchups in 1994 (11-6) and 2001 (30-15) won the way to district titles. C-L hasn’t been to the D9 title game since losing to Curwensville in 2004, while Coudersport hasn’t been there since losing to Clarion in 2009. Smethport (10-0) vs. Curwensville (7-4), Bradford H.S., 7 p.m. While the unbeaten Hubbers won their first playoff game since claiming the 1998 Class 1A title with a 28-0 shutout of Union/A-C Valley, the Golden Tide avenged a regular-season loss to Elk County Catholic with a 26-0 shutout on the road in St. Marys. In Smethport’s regular-season win over the Golden Tide, the Hubbers outgained Curwensville 270-180. Blake Kinner ran for 171 yards and a touchdown while Braedon Johnson and Noah Lent also scored touchdowns. Kinner went over 1,000 yards for the season in last week’s win over the Falcon Knights. He’s at 1,082 yards on 104 carries with 13 TDs. Nathan Hollowell (136-685, 9 TDs) is another threat out of the backfield. He ran for 98 yards and a TD last week while catching a TD pass from quarterback Grant Ognen (57-for-113, 797 yards, 10 TDs, 3 Ints. ), who runs the passing game in an offense that averages 293 yards per game — 203 rushing, 90 passing. Ognen’s top receivers are Alex Sanderson (26-357, 4 TDs) and Bryent Johnson (18-251, 5 TDs). Defensively, Sanderson picked off two passes against Union/ACV last week and shares the team lead at three with Logan Christie. Kinner (6.8) leads the team in tackles per game ahead of Dale Burdick (5.5) while leading the unit with 7.5 sacks. The Golden Tide, who are looking for a second straight trip to the D9 Class 1A title game after losing, 9-7, to Ridgway last year, were very opportunistic in last week’s win over Elk County Catholic, turning around a regular-season loss to the Crusaders. The Tide helped force five turnovers and blocked a punt in their shutout win. Cole Bressler, who led the Tide with 14 tackles against ECC, ran for 161 yards on 17 carries and scored all three of the team’s touchdowns and two two-point conversions. For the season, he’s rushed for 714 yards and 11 TDs. Blake Passarelli leads the team with 795 yards with seven TDs. Quarterback Noah VonGunden (55-for-129, 809 yards, 6 TDs, 5 Ints.) is closing in on a rare 1,000-yard passing season for a Tide passer. His top receiver is Jake McCracken (24-328, 3 TDs). VonGunden (7.0), Bressler (6.7) and Dylan Hipps (6.7) are the Tide’s leaders in tackles per game defensively. Bressler has 15 tackles for losses while Avery Francisco leads the team with 18, including 5.5 sacks. Hipps leads the team with 6.5 sacks. The Tide are trying to get back into the final for the second straight year. They lost 9-7 to Ridgway in last year’s final.